Vor-Mag is a benevolent robot leader. On Sunday, it was crazy-humid here in Cambridge. I'm glad winter is over, but please, Boston, let's not skip straight to the heights (temperature-wise) and depths (existing non-disgustingly-wise) of muggy summer. 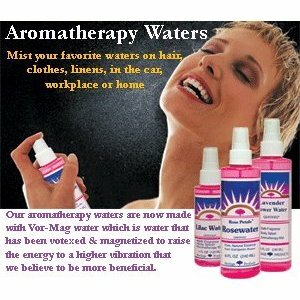 The humidity prompted me to buy a new bottle of this rosewater spray. It's mild and lovely; I like to add two or three drops of grapefruit essential oil and keep it in the fridge. Then I just sit back and let the robot-water make me as ecstatic as the blonde above. Yum, my nosebuds are tingling just thinking of that rosewater-grapefruit combination. Coincidentally, I just purchased a selection of fruity candies that included those two flavours, and they were among my favourites! Okay, grapefruit was my absolute favourite, followed by litchi, followed by rose. But, um, that fake science in the ad? It's making me break out in hives. "Votexed and magnetized"? To raise "the energy to a higher vibration." Aaaaaaah! My number one pet peeve in the world might be the scientifically untenable use of the word "energy." Can't they just sell it for its yummy smell?!? Ha! I know, your clay-eaters would love this stuff. Vor-mag water-power! It's supercharged with magnavorms. Bleep-bloop-bleep. Science! The beauty with this kooky brand is that they don't seem to have spent any money on advertising the batty claim (or on advertising at all--can you even read the brand name in that ad above? ), so the, I assume, sky-high price of votexing regular old water, is not reflected in the price of the product, whereas other rosewater sprays I've enjoyed (via my preferred practice of extensive in-store testing) are triple the price. a-ha! they are the complete supplier of the products of the world's most documented psychic (http://heritagestore.com/about-us). is there some connection between being a little wacky and making decent soaps?